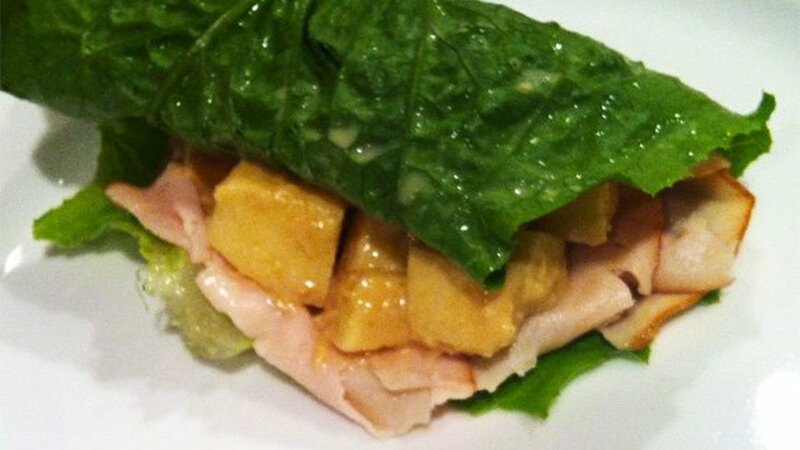 This wrap is a great quick lunch that travels well, so you can take it to work or the gym. It's a versatile recipe; add any fresh vegetables you might have on hand to bulk it up and add more fiber. The cost is only about $2.50, and equally important, it'll keep you out of the deli. Place romaine lettuce leaves in a shallow bowl of ice water for about five minutes to crisp them. In a small bowl, combine hummus and cumin, mixing well. Add the apple and stir to blend well. Lay one lettuce leaf lengthwise on a clean surface, with the widest edge closest to you. Lay three pieces of chicken breast onto the lettuce, then spoon half of the hummus mixture in a mound about two inches in from the edge. Roll up burrito-style and repeat with the remainder. Makes two wraps for one serving.